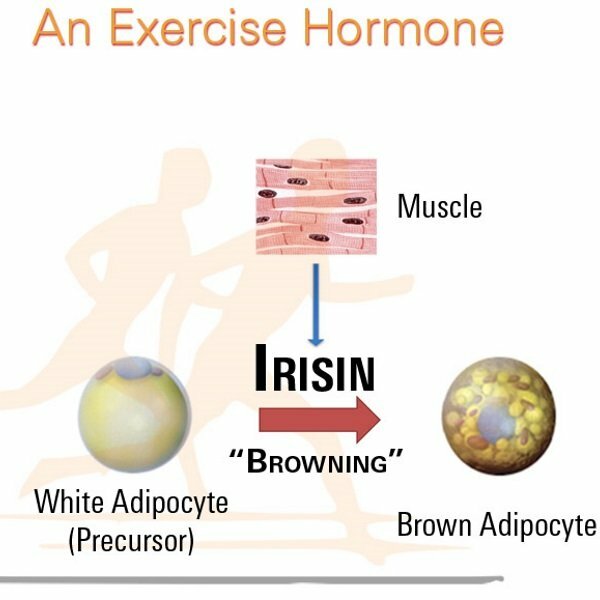 Irisin is a hormone that breaks down fat tissue, inhibits cancer cell development and delays aging processes. According to sports scientists at Seoul National University, strength training can increase the amount of the hormone that muscles secrete. The more muscle tissue strength athletes build up, the more irisin their muscles pump into the bloodstream. Irisin is an extremely interesting hormone. It is made by muscle cells and inhibits the growth of cancer cells. Irisin may be the reason why hundreds of studies have shown that physical exercise drastically reduces the chance of developing cancer and increases the survival chances of people who already have cancer. Irisin is also a longevity hormone. Researchers have found high concentrations of irisin in the blood of people who live to be very old and are healthy. Irisin may also be behind why natural bodybuilders also live to an improbably old age in good health. Their muscle tissue protects them against the processes of aging. The researchers divided 20 overweight subjects (their fat percentage was over 30 percent) into three groups. One group did nothing at all for the 8 weeks that the experiment lasted and functioned as the control group. A second group trained five days a week in a gym, doing an hour of cardio training each session. A third group trained as well, but did strength training. The researchers gradually increased the intensity of the workouts for both active groups as the experiment progressed. At the end of the 8 weeks, the researchers found more irisin in the blood of the men who had done cardio training [AT], but the increase was not significant. The men who had done strength training [RT] had more irisin in their blood, and the increase was statistically significant. The training programmes changed the subjects’ body composition: their muscle mass increased and fat mass decreased. The stronger the effects, the bigger the rise in the irisin level. That an increase in muscle mass is accompanied by an rise in irisin concentration is not surprising, but how a decrease in body fat boosts irisin levels remains a mystery to the Koreans. Does fat mass inhibit the synthesis of irisin by the muscles? Or was the decrease in fat mass a consequence of the higher levels of irisin? Follow-up studies are needed to throw more light on the matter, the researchers write. Physiol Res. 2015 Oct 8. [Epub ahead of print].